enaio® from OPTIMAL SYSTEMS supports the human resources departments of your company by providing flexible enterprise information management technology. An essential component is the digital personnel record: It bundles all employee information in a central repository and allows for secure access to the desired documents at any time and from any location. Comprehensive automation and workflow functions ensure intelligent control of your document management processes. enaio®’s extensive applicant management functions facilitate recurring tasks in the recruiting process. This includes writing the job advertisement using an individually adaptable qualification catalog and matching based on automated target/actual comparison of the applicant profiles. A digital personnel record means that all relevant information is only a click away and tightly interlinked for rapid access. Digital workflows and cross-departmental document access speed up personnel management. With enaio® you can file, archive, and delete contracts, e-mails, and personnel data in an audit-proof manner. The bundling of all employee-specific information in one system enables access to all data. A configurable roles and rights system as well as various workflow functions result in perfectly orchestrated processes. 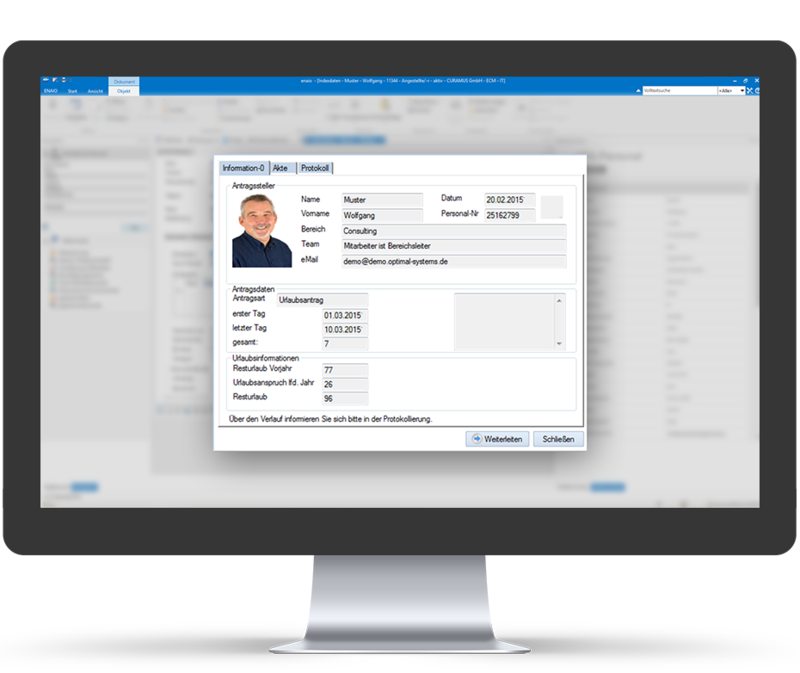 The digital vacation workflow of enaio® reduces the effort of submitting and managing annual vacation requests. Convenient processes for handling electronic mail? That’s what you get with enaio®. The solution ensures the automatic assignment of e-mails in the corresponding business context and thus prevents the redundant storage of e-mails or attachments. All e-mails about a person or a process are available at the push of a button – regardless of which workstation is being used. In the context of job postings, e-mails can trigger workflows (e.g., application, hiring, or job ticket workflows). The human resources department further benefits from our ECM solution as the automated inbox automatically captures, indexes, and stores documents in the correct personnel record. 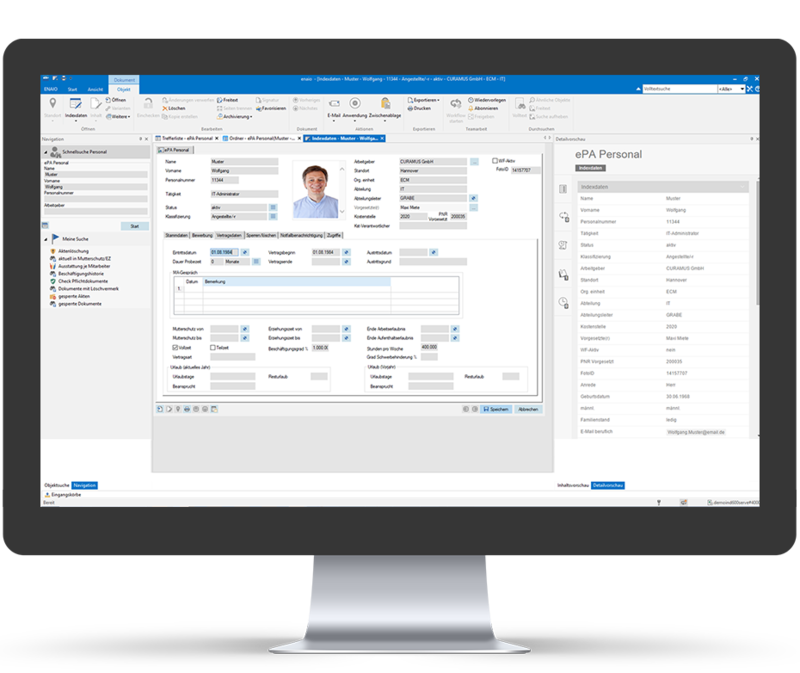 The options for template and form administration in enaio® support you in personnel administration and ensure that all authorized employees always work with the latest document versions, e.g., for applications, certificates, data protection declaration, personnel forms, and approvals. 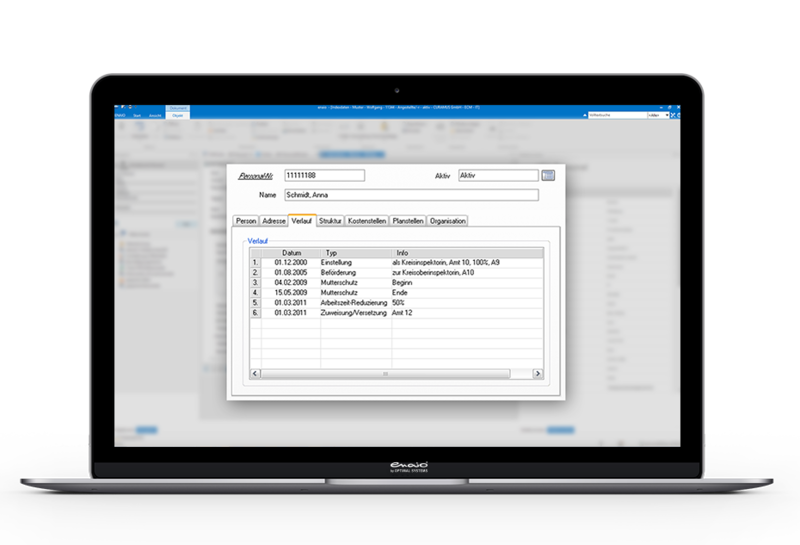 The enaio® applicant management tool integrates seamlessly with your existing office software. In addition to supporting Microsoft Office, input from various other input channels such as standard mail or your own career website can also be easily integrated into the automation processes. Use subscriptions, follow-up, and favorites to make your HR processes even more flexible. This way, you will be immediately informed about contract adjustments or additions as well as newly added or removed documents. Moreover, this system does away with media discon­tinuities. Notice: OPTIMAL SYSTEMS offers different variants of the enaio® personnel record solution. These differ in the features they offer as well as in the design of the user interface. We are happy to provide more details about this in a personal consultation session. In addition to the fast provision of information, documented access control is of great importance to us. Avoiding data and document redundancy also plays an important role as such features facilitate the administration of our IT systems. Furthermore, the ongoing scrutiny and redesign of existing processes results in further optimization. When implementing business processes using workflows, a lot can be gained from rethinking existing processes. Weaknesses are uncovered, processes are streamlined, and the optimized processes are speeded up by electronic workflows.